mmsonline.com March 2017 MMS 71 FEATURE them to a satisfactory level of detail, because I promised that I wouldn't. Parts I have seen recently at Imperial represent advances valuable enough to their designers that details about the parts are confidential. However, even vague descriptions can help convey the nature of the work the shop is now doing and the benefits it is bringing to customers. E xamples of critical components Imperial has made through SLM include: • High-temperature hardware. A piece of hardware used in making another product will enable the manufacturing process for that prod- uct to achieve a much higher temperature than what is possible today. Thanks to 3D printing, an intricate array of conformal cooling channels grown into the form of this piece of hardware will enable the temperature jump. Previously, this item's cool- ing came from a colle ction of ex terior tube s assembled through welding. 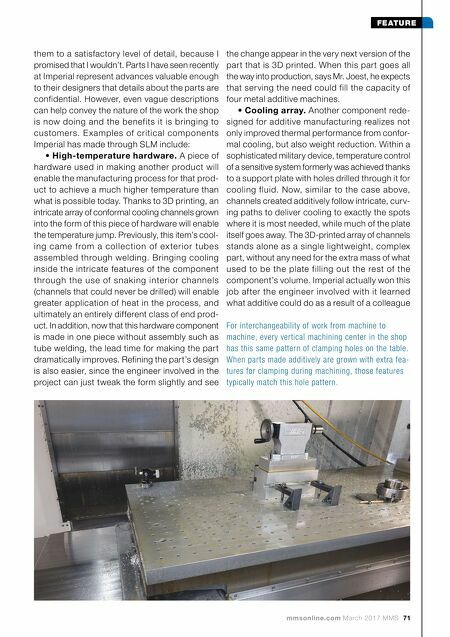 Bringing cooling inside the intricate features of the component through the use of snaking interior channels (channels that could never be drilled) will enable greater application of heat in the process, and ultimately an entirely different class of end prod- uct. In addition, now that this hardware component is made in one piece without assembly such as tube welding, the lead time for making the part dramatically improves. Refining the part's design is also easier, since the engineer involved in the project can just tweak the form slightly and see the change appear in the very next version of the part that is 3D printed. 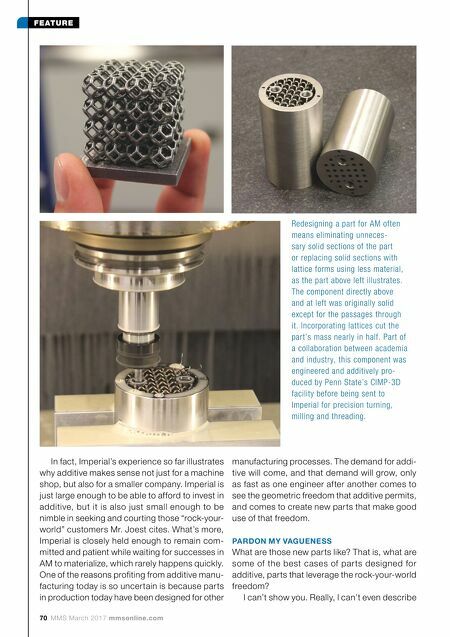 When this part goes all the way into production, says Mr. Joest, he expects that serving the need could fill the capacity of four metal additive machines. • Cooling array. Another component rede- signed for additive manufacturing realizes not only improved thermal performance from confor- mal cooling, but also weight reduction. Within a sophisticated military device, temperature control of a sensitive system formerly was achieved thanks to a support plate with holes drilled through it for cooling fluid. Now, similar to the case above, channels created additively follow intricate, curv- ing paths to deliver cooling to exactly the spots where it is most needed, while much of the plate itself goes away. The 3D-printed array of channels stands alone as a single lightweight, complex part, without any need for the extra mass of what used to be the plate filling out the rest of the component's volume. Imperial actually won this job af ter the engineer involved with it learned what additive could do as a result of a colleague For interchangeability of work from machine to machine, every vertical machining center in the shop has this same pattern of clamping holes on the table. When parts made additively are grown with extra fea- tures for clamping during machining, those features typically match this hole pattern.